More about CALA and PHA: The Cache la Poudre River National Heritage Area is one of 49 National Heritage Areas (NHA) in the United States. NHAs are places where natural, cultural, historic, and scenic resources combine to form a cohesive, nationally distinctive landscape arising from patterns of human activity shaped by geography. CALA stretches 45 miles along the curves and bends of the hard-working Poudre River from the eastern border of the rugged Roosevelt National Forest, down through the blossoming cities of Fort Collins, Windsor, and Greeley, until the vital water resource conjoins with the South Platte River in the Colorado eastern plains. As the managing organization behind CALA, the Poudre Heritage Alliance serves the local communities of Larimer and Weld County by building a deeper understanding of the Poudre River’s national significance as it relates to water law and water management. PHA and CALA bring together residents, private organizations, and government entities behind this common goal, while also enticing tourists with the recreational, environmental, and historical points of interest throughout the Heritage Area. PHA programs and initiatives that support these efforts include volunteer trainings, grant-funded projects, and outreach events that help educate people about water history and the importance of the Poudre River corridor today. April 20, 2017 – Colorado’s National Heritage Areas oversee a wide variety of programs and services that make economic and cultural impacts throughout their regions while receiving a large portion of their funding from the federal government. The NHAs in Colorado collaborate with local governments, county administrations, and federal agencies, including National Parks such as Rocky Mountain and the Great Sand Dunes, as they wisely utilize these federal dollars. Not only are the three NHAs in Colorado joining forces on a new marketing initiative, but they are also busy highlighting their importance to local communities in the face of potential federal budget cuts. 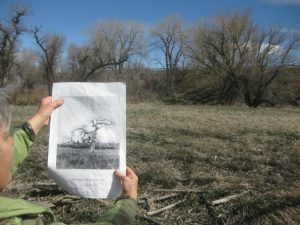 The Cache la Poudre River, South Park, and Sangre de Cristo National Heritage Areas are currently working together with a Colorado Tourism Office grant on a coordinated marketing effort that showcases the importance and accessibility of these unique areas. A new website landing page will include a map that connects travelers to all three areas while providing information on recreational and educational opportunities available in each. South Park will focus on education through recreational themes, interpretive exhibits, and heritage trail items. Sangre de Cristo will look at historical and cultural elements by offering tours and classes. The Cache la Poudre River will highlight how local industry can play a role in National Heritage Areas through railroads, ranching, and beer. For now, check out the National Park Service website locator for more information about these areas, and read on for additional facts about the Colorado Heritage Areas and how they are making an impact alongside the National Park Service. A few more examples of completed projects in 2016 by PHA include the first annual Heritage Culturalist volunteer training program; partnering to develop the Byways Loop Tour that connected the Heritage Area and three Scenic Byways for a creative heritage and natural tourism experience; and working with the State Historic Fund and Poudre Landmarks Foundation to create plans for turning the 1882 Water Works into a Water Interpretation Center. South Park National Heritage Area (SPNHA): SPNHA has been able to leverage federal funding on a 6 to 1 basis with Sales Tax revenues increasing by as much as 12%. Under their current agreement, the SPNHA is looking at a 9 to 1 return according to its 2016 Annual Report. Working with partners, the SPNHA has preserved trails, supported events, and boosted community pride. Every year the SPNHA provides grants to local non-profit groups which enable these groups to successfully complete outstanding and vital projects through Park County. This projects include preserving Park County’s industrial, railroad, and ranching heritage. Additionally, SPNHA promotes heritage tourism and community development through the promotion of authentic rural American towns such as Hartsel and Alma. Without funding and support from SPNHA, many of these local initiatives would be greatly curtailed due to the lack of infrastructure and financial support. Sangre de Cristo National Heritage Area (SdCNHA): SdCNHA has been able to leverage federal funding and equally match it from partner organizations for a 2 to 1 return on investment according to its 2016 Annual Report. Working with partners in Alamosa, Costilla, and Conjeos Counties, SdCNHA has preserved historic buildings and a unique cultural language; invested in educating youth about local culture and history, interpretive signage, and events; and is currently working on designating four sites within the region as National Historic Sites. SdCNHA focuses on historic preservation, heritage tourism, community revitalization, and cultural education.In the past two years the SdCNHA has provided funding to local organizations to hold an archeology youth camp for junior high and high school students, preserved the Nasario Gallegos house in Costilla County, awarded educational scholarships to local students, and initiated an ongoing oral history project that records the historical stories and assists teachers in creating curriculum to teach that local history in the K-12 school districts within their heritage area. Funding issues: National Heritage Areas are places where historic, cultural, and natural resources combine to form cohesive, nationally important landscapes, and a large portion of their funding comes from the National Park Service. However, NHAs are not federal entities, do not own or affect private property rights, and are administered typically through a local non-profit or unit of local government. Unlike national parks, National Heritage Areas are large lived-in landscapes. Money that comes from the federal budget goes into projects that the NHAs oversee, like volunteer trainings, historic preservation, tourism, community revitalization, and heritage education. These programs encourage financial partnerships with public and private sectors and produce greater benefits to taxpayers than the initial federal dollars invested. The impact of the Colorado NHAs on their local communities and economies provide a large return on investment for every federal award that is given, which could not be substituted for funding solely at the local level.